Most economic indicators suggest the economy is doing well. A huge tax cut / spending increase. Need a salesperson? Get in line. The North American sales market is white hot right now. Recently a Client shared, "Hiring scorecard? If I followed our hiring scorecard right now, we wouldn't be hiring salespeople." That kind of talk scares the hell out of me. Aggregate household debt increased in Q1 2018 for the fifteenth consecutive quarter. Since the beginning of 2018, the Fed has raised interest rates twice with two more expected before year end. Much of consumer debt is tied to interest rates. When interest rates rise, debt payments increase thereby reducing disposable income. Trump's trade war will undoubtedly raise prices for consumers and business. While each of these economic head winds are concerning the most concerning is the very real likelihood of an inversion of the Treasury bond yield curve occurring. Treasury bond yield inversion explained - The inversion of the Treasury bond yield curve reflects shorter-term duration bond interest rates yielding more than longer-term bond interest rates. This relationship is NOT normal. The Treasury bond yield curve inversion has successfully foreshadowed all seven of the most recent recessions. Check out the following chart graphic courtesy of the Federal Reserve Bank of St. Louis. Note each inversion and the subsequent economic downturns are represented by the vertical grey bar regions. Click on the following chart link to interact with the relationship between the inversion and the subsequent recession. By clicking on "Max", the chart will reflect historical yield spreads and recessions back to the late 1970's. Few sales teams recession proof. Let's be honest. No sales team is completely recession proof. 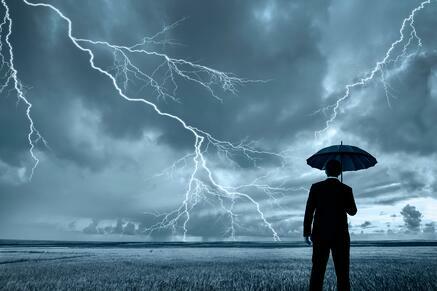 The question is, "Is your sales team as strong as it could be to weather the recession?" The stronger your sales team, the better able you and they will be able to not only weather but take advantage of the coming recession. Precious few sales teams are as prepared as they could and should be. Sales Selection - Most sales organizations have a sales hiring process that is more gut and ego-based than science-based. Sales Systems - Most sales systems allow too much adoption variance. In other words, most sales teams that have a sales system allow "high performers" or flight risks to decide for themselves if they will adopt the sales system. Sales Culture - Most sales organizations have an accountability problem. This can range from poor adoption of sales systems to retention of low-performing salespeople. The reason there is so much work to do in these areas few companies will invest appropriately nor will they make the changes and do the work necessary. The coming recession will be a tremendous opportunity. For those that are not properly-optimized (most), the coming recession is going to be hell. For true Wolf Class sales teams who are properly-optimized, the coming recession is an incredible opportunity from two perspectives. Salespeople who have the ability to sell and the skill to deliver value will dominate those who do not. The coming recession will be an opportunity to cherry-pick Sales Wolves. There will be layoffs and quite often recession-driven layoffs are not terribly strategic. The best mindset is one of never-be-satisfied. There is always, always a better way. You just need to identify, adopt and optimize better ways before your competition does. Sales Selection - Are you hiring salespeople based on gut feel or are you using a science-based sales personality test with a sales hiring scorecard? Sales Systems - Is your sales team still figuring out the best sales processes, using notecards / spreadsheets / memory to keep track of prospects? Sales Culture - Is accountability something only accounting has in your company? Now is the time to fix, shore-up and improve these essential areas. The timing of the recession. A recession is defined as two consecutive quarters of negative GDP growth. Think about that for a moment. We do not know we are in a recession until we are essentially six or more months into it. When you hear pundits ask, "Are we in a recession?" Chances are we are in a recession. Do not rely on economists. Not surprisingly, economists are not particularly good at predicting them because economic indicators can be so positive and so misleading. Prakash Loungani, an economist at the IMF, showed in a study that professional forecasters missed 148 out of 153 world recessions. This is not surprising because economic indicators rarely flash a warning prior to the onset of a recession. My current prediction for the recession is the 2nd Quarter / 3rd Quarter of 2020. When the Treasury bond yield curve inversion actually occurs, I will update my prediction accordingly. Confused about how an inverted yield curve predicts a recession? Read this article.